Lynn Nadler was a joy to work with for the process of selling and buying. She was always available to answer questions, whether via phone, email, or text. She was flexible and willing to rearrange showings on short notice when our timeline accelerated (because she sold our house in less than a day!). She made sure I felt very comfortable seeing just one house at a time OR many, even with two small children, if that was what fit my plans. Lynn was also honest, pointing out positive and negative points about properties that I might have missed. When I found a home I loved I was made more confident in my decision because it was centered in a neighborhood she had worked in before and could speak from experience that it was a good fit for my family. I can’t imagine using a different real estate team. 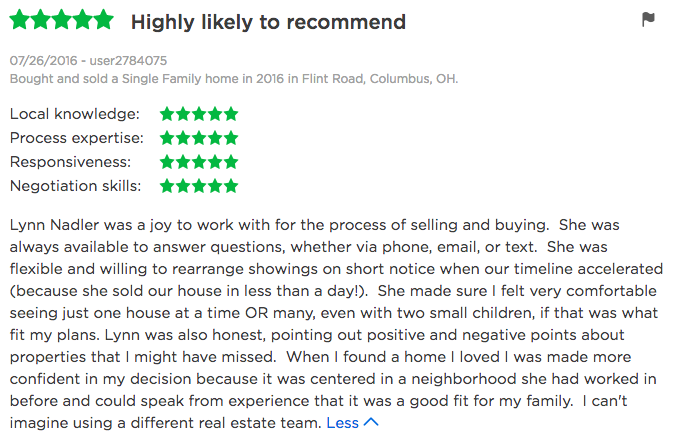 Sarah Mullen was exceedingly helpful in my finding the best possible home for me to live in Columbus. She learned my needs and wants quickly and listened carefully to my concerns. As I was moving from Texas, she made the most expeditious use of my time in the two trips to Ohio in May. Sarah anticipated all my needs and walked me carefully through every step of the process. She remains available for any questions I may have on this property. To anyone who needs the right house in the right location at the right price, I would recommend Sarah Mullen. I have worked with the LaBuda group to purchase and sell a total of 3 homes. I am a repeat customer because of the knowledge the team has, processes for ease of transaction, and overall success I have continued to have with them. 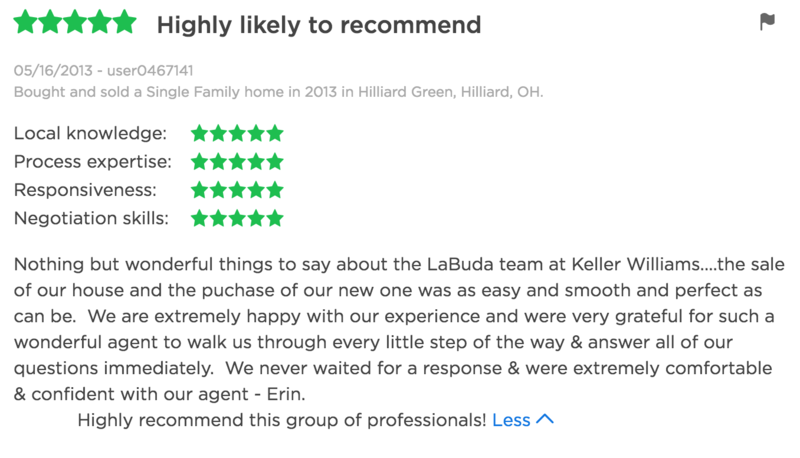 We used the LaBuda Team to both buy and sell our most recent homes, and truly couldn’t say enough wonderful things about them. The Team worked together to create a seamless and stress free experience. And Erin was knowledgable , professional and fun which made the home buying experience a pleasure! 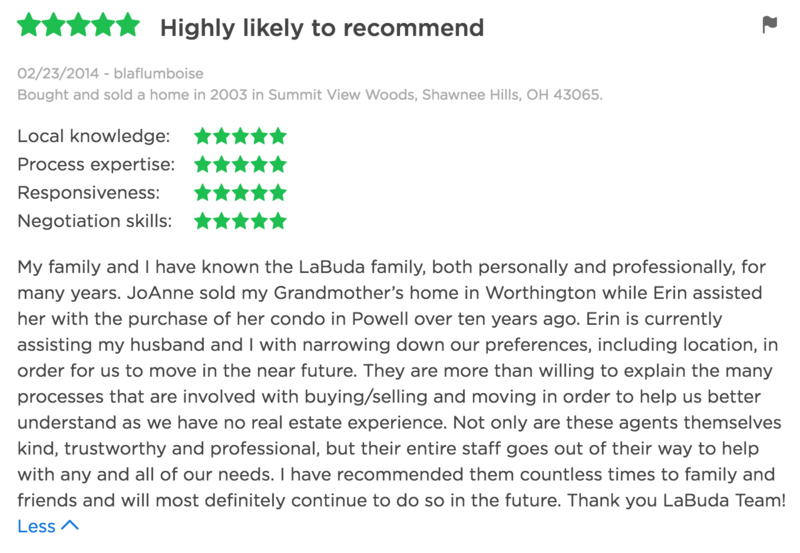 We recommend the LaBuda Team without reservation to all our family and friends! 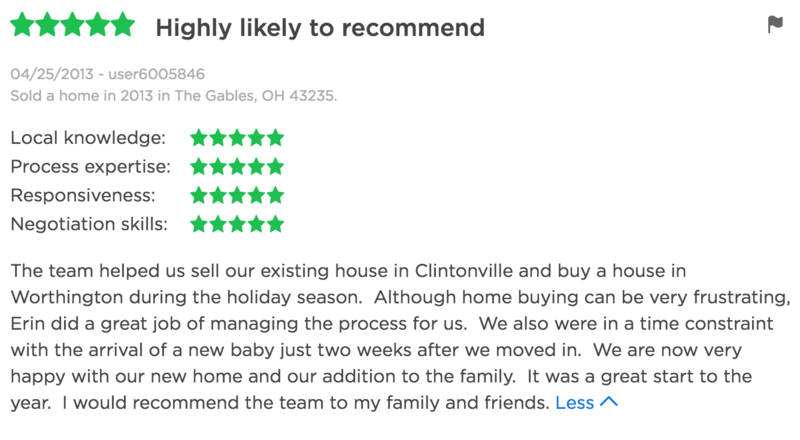 The team helped us sell our existing house in Clintonville and buy a house in Worthington during the holiday season. 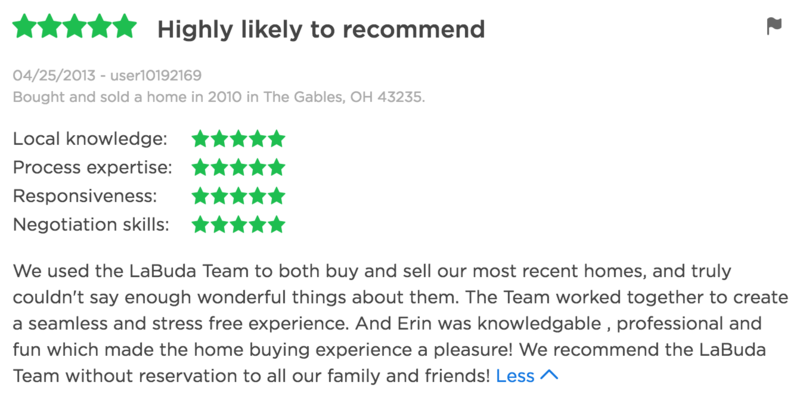 Although home buying can be very frustrating, Erin did a great job of managing the process for us. We also were in a time constraint with the arrival of a new baby just two weeks after we moved in. We are now very happy with our new home and our addition to the family. It was a great start to the year. I would recommend the team to my family and friends. Nothing but wonderful things to say about the LaBuda team at Keller Williams….the sale of our house and the puchase of our new one was as easy and smooth and perfect as can be. We are extremely happy with our experience and were very grateful for such a wonderful agent to walk us through every little step of the way & answer all of our questions immediately. We never waited for a response & were extremely comfortable & confident with our agent – Erin. Highly recommend this group of professionals! My family and I have known the LaBuda family, both personally and professionally, for many years. JoAnne sold my Grandmother’s home in Worthington while Erin assisted her with the purchase of her condo in Powell over ten years ago. Erin is currently assisting my husband and I with narrowing down our preferences, including location, in order for us to move in the near future. They are more than willing to explain the many processes that are involved with buying/selling and moving in order to help us better understand as we have no real estate experience. Not only are these agents themselves kind, trustworthy and professional, but their entire staff goes out of their way to help with any and all of our needs. I have recommended them countless times to family and friends and will most definitely continue to do so in the future. Thank you LaBuda Team! Thank you! Your entire team are perfect professionals! Erin LaBuda, in particular, was invaluable to us! This was our second time utilizing The LaBuda Team. Lynn provides top notch service that is hard to find. While looking for a new home and listing our own, I heard many horror stories from friends & family that were in the same boat as us. We never had a call un-returned, our home was well marketed and we experienced another flawless transaction! Jo-Anne is awesome! The entire team is awesome! Another very satisfied client. Go Jo-Anne and the entire LaBuda Advantage Team! Thank You!